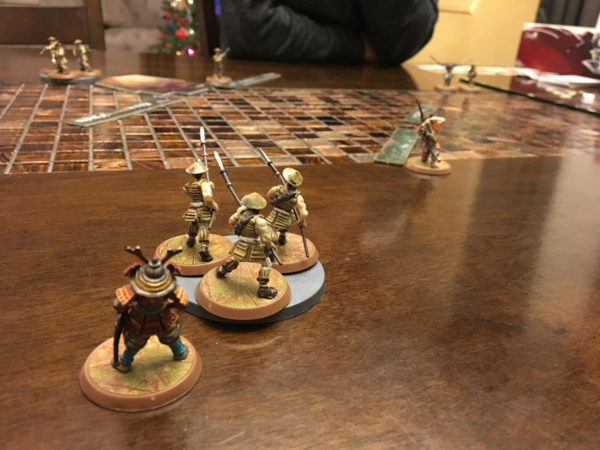 Right before Christmas, my friend came over jonesing for some gaming before the break. After an interesting game of Photosynthesis with the missus, she adjourned and we had a few game options to hit as the night was still young. 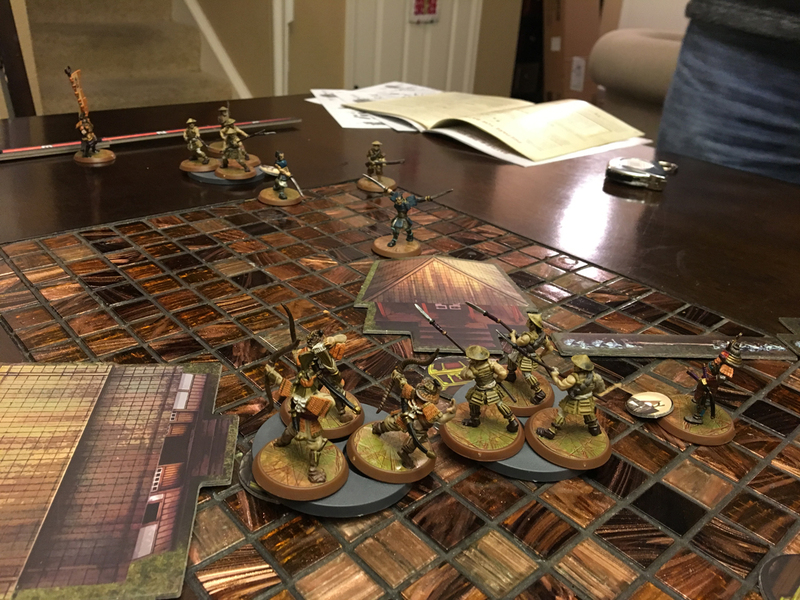 We settled on trying out a new-to-us minis game: Test of Honour. Test of Honour is a feudal Japan skirmish game centering around your Samurai Hero and his commoner followers. Produced by Warlord Games, it is an inexpensive minis game (relatively speaking) as it has a pretty significant group of forces in the $50 core set. There is a reason for the low cost however, and that is the figures come unpainted and unassembled. I’ve been around the minis block enough times that “unpainted” is fine and “some assembly required” isn’t a problem. Well…this was a little more than I expected. After digging around on the net, it sounds like this is one of the biggest complaints about the game- the assembly of each figure is done in a kit-model approach. These are the Samurai build instructions and the commoners are no less complicated. That Samurai on the lower right has twelve pieces alone. For a special unique 50 mm Warjack or large centerpiece mini? Sure I’ll run it through an old school modeling kit session but this much work for a bunch of uninspired common speardudes? I can see that being a big turn off. Obviously we knew this going in and were undaunted as we were already prepared for this situation. To get around the lack of models issue I turned back to my first big gaming crush. Ok. well my second gaming crush (after Magic: the Gathering): Heroscape. My Heroscape collection had plenty of colorful Samurai figures to recycle for the demo we were about to try out. With figures and templates on the table, we were ready to begin. The rule book is not long and seemed easier than Walking Dead: All Out War. We set up on both sides of the scenario. The flavor is definitely there as we were two young Samurai who were going to pray at the same temple. We arrived at the same time and since neither would yield, we would decide it with blood instead. 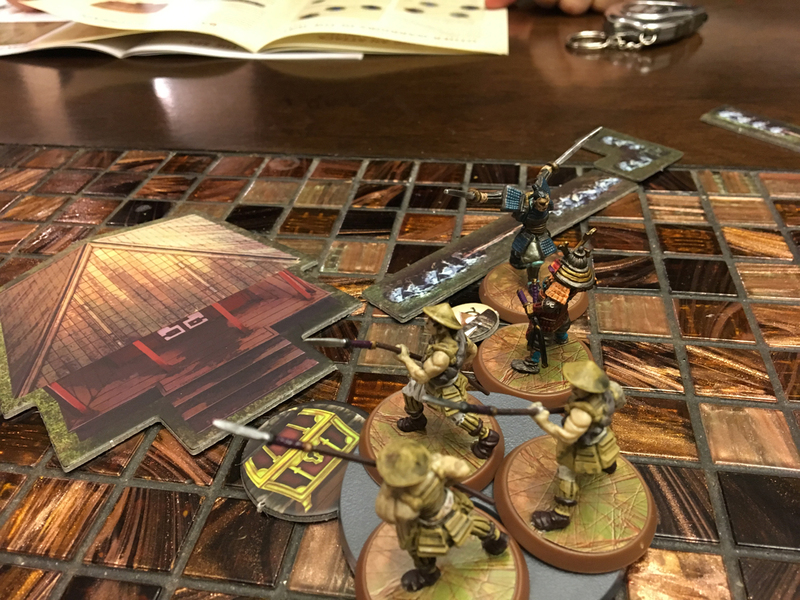 The goal was simple (as this was the demo “learning”scenario): kill the other Samurai Hero. We both had two individual ranged weapon figures, a group of spearmen, and our Samurai Hero. The game uses a token-based activation system where you put all your available activations in a cup or bag, add in three “fate” tokens, and then blindly draw what gets to activate. 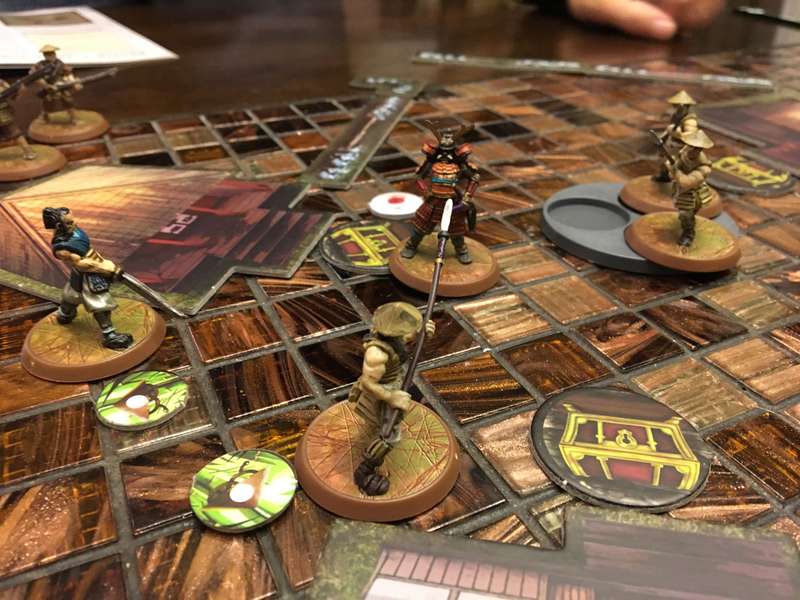 Tokens are separated into two main types: Samurai and Commoner. If you draw a token of the given type, you can activate with any figure/unit of that same type. There are some interesting other nuances but that is activating in broad strokes. 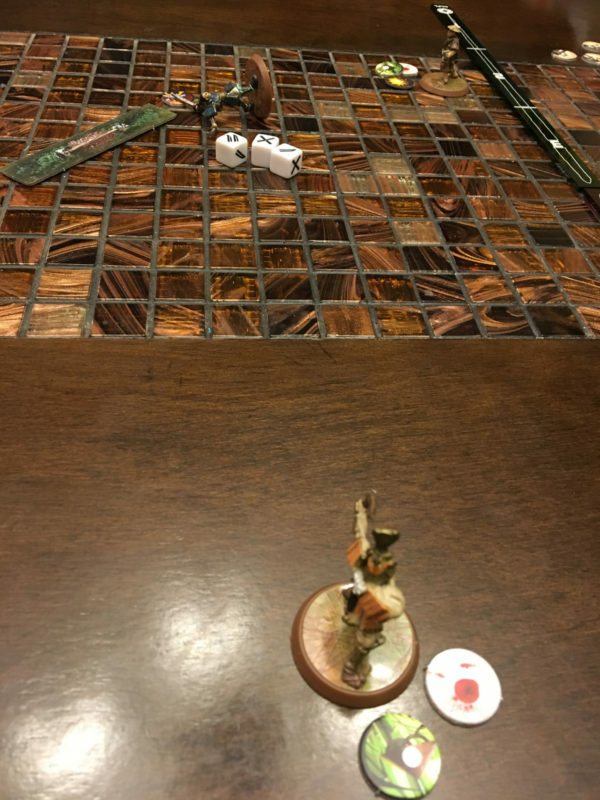 If all three fate tokens are pulled from the bag, the round ends. You then put all the activation tokens back and start again. 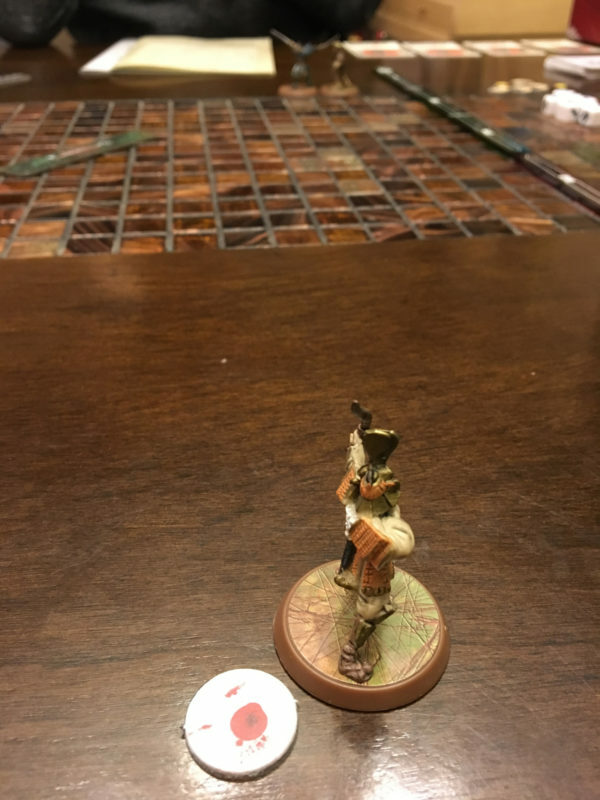 I got to start and pulled a Commoner token so I activated my bowmen and took a shot at my opponent’s ranged musket figure. The game uses custom dice with sword, blank, and “X” symbols. Units roll dice based on their stats and are looking to see 3 successes (sword symbols) to succeed on the action (shooting, dealing damage, dodging, etc). If you get five successes, it becomes a critical success and you consult the table to see what happens. If you ever have more “X” than successes, you critically fail and again consult the table. That was how my archer started the game, crit-failing his aim test to shoot the other dude. Apparently he messed up pretty bad because it caused a wound on him. Figures typically only have one health so to get around such a binary life/death result, the game adds in “blood counters” for when the opponent doesn’t succeed on an attack well enough to kill you. For every blood counter you have, the opponent gains an extra die, making it easier to kill you next time. 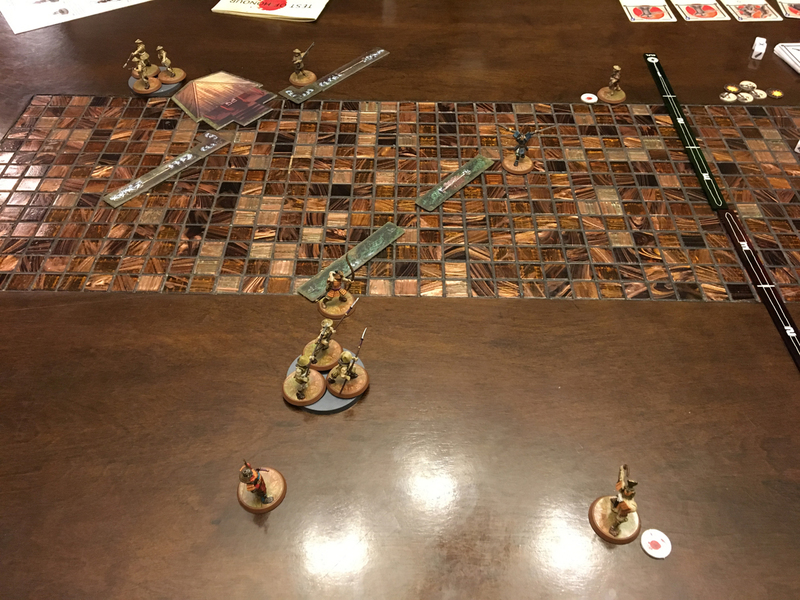 The round ends quickly as my opponent was able to pull out all three Fate tokens. I think he had about one activation that whole round against my four activations. Since he drew the last Fate token, he gets to start the round by drawing the first token of the round. He pulls a commoner and crits the crap out of my other archer. The archer dies horribly but I am able to keep my spearmen rallied as they succeed their Honour roll (when guys start dropping around you, everyone within 6 inches must make a morale test or flee in the opposite direction). My Loyal Spearmen prove their worth. Unfortunately, they work for a weak-willed lord who cowers at the sight of his archer taking a musket ball to the face. 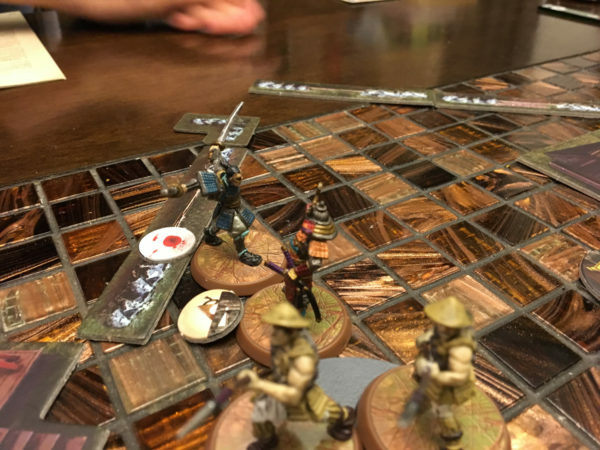 My cowardly Samurai has to flee directly away and that means he’s off the table. In other games, that is usually the end of the story but in Test of Honour, you get one last rally attempt and my guy is able to just barely rally and not flee the battle entirely. On his next activation, he’ll come sulking back to the table. 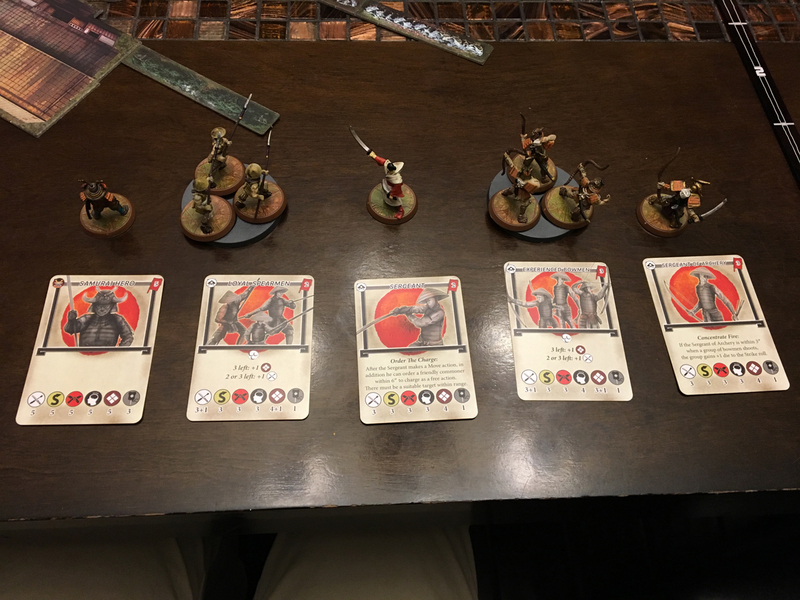 Next up, I pull a Commoner token and have my blooded archer retaliate. He scores a hit and the opposing Samurai whiffs his dodge roll. I then crit my damage roll and take down the opposing hero for the win. Demo game lasted maybe 20 minutes. Obviously, this was pretty swingy and the fact that my friend did almost nothing in the first round due to the Fate tokens was a hard bit of business. We did like the story the game told and the highly luck-based system (at least in this demo) seemed entertaining enough that we decided to delve deeper into the rules and start the next scenario. 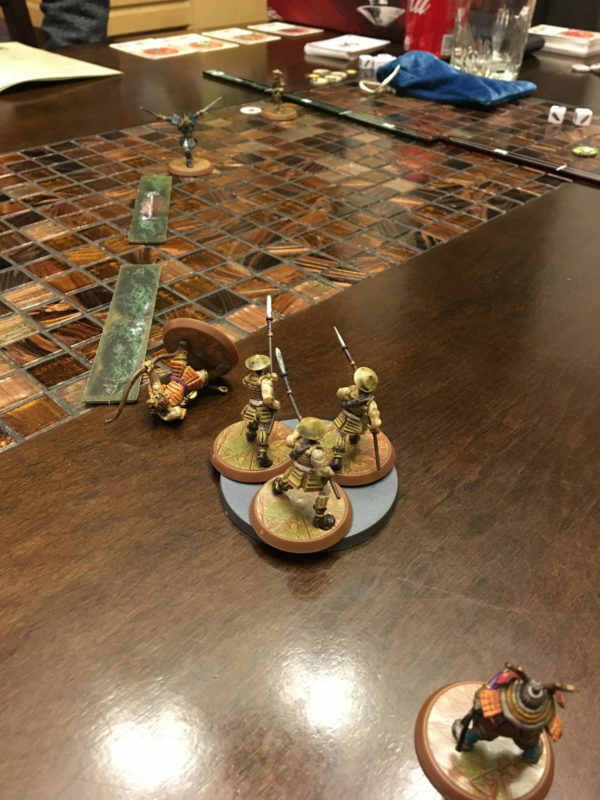 This time, we got to try our hand at force building and so I took a group of Spearmen, a group of Archers, and the accompanying Sergeants to help each group do better. And my cowardly hero stuck around too… after he burnt that shrine to the ground. Apparently this pissed off my rival hero (after he recovered from being Arrowed) and so while I was busy babysitting some lame camp, he decided to sneak up and try to sack the place to make me look like a chump. This time, the goal was to control the most objectives (the treasure chests) at the end of the fifth round. 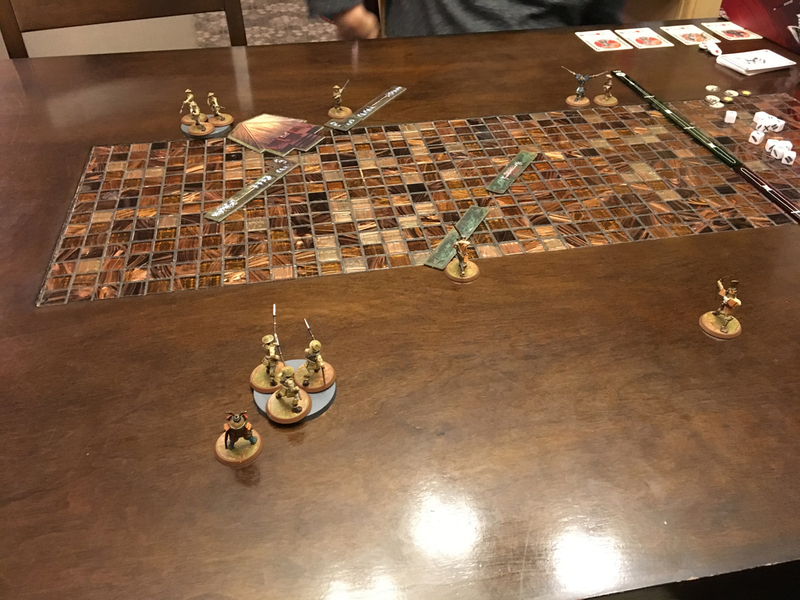 The previous game was at “11 points” of figures but this time we were at 15 points. This added quite a few activation tokens to the bag so our turns were longer and less prone to those Fate tokens. 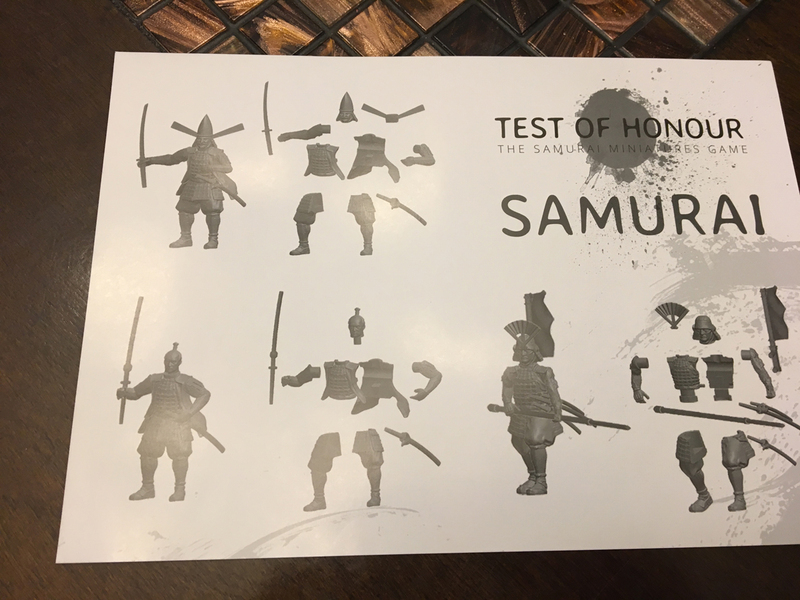 Also, in this scenario, we started playing a fuller set of rules where drawing the Fate token lets you draw a new skill card for your Samurai. You still lose a turn but hopefully you’ll be more effective for sitting out. This worked for me as I drew decent skill cards but my opponent got hosed with a bunch of useless cards. My friend takes a slow approach, using the buildings for cover while I try to choke up the main entrance. Ever the brash and impulsive Samurai, my friend’s hero leaps over the wall and decides to take the fight directly to my hero. The bold move backfires and since he can’t retreat back over the wall, he gains a blood token for his efforts. After some additional exchanges, the brash hero succeeds and deals damage to my Samurai Hero. Playing by the full rules this time, death does not come easy to heroes so I roll a test and if I pass, I survive the blow and take an injury card instead (a second injury will kill the Samurai outright). I’m able to pass the test and suffer a blow to my leg, making it harder for me to dodge incoming hits. In the next exchange, however, I’m able to kill my opponent and he fails his injury test and dies on the wall. His men are loyal to a fault and rush in killing a spearman. 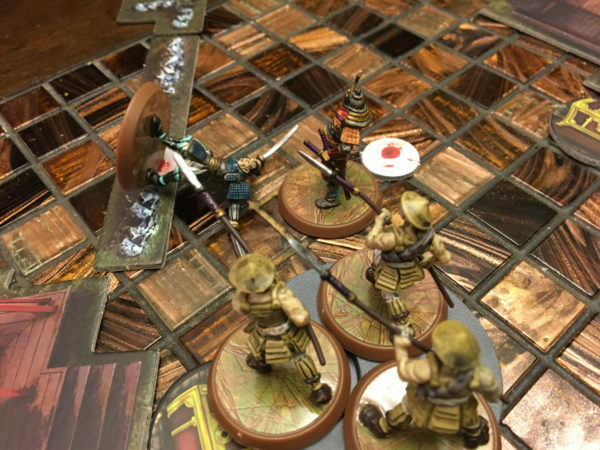 My spearmen retreat and my Samurai Hero now has a taste for blood. He rushes the spearmen group and gets a crit on his attack, killing the first fool. The crit lets him follow up again with another attack and he fells the second fool. I’m out of crits so the last pathetic commoner just sits there in a pool of his own urine. And likely the blood of his fallen comrades. Tough life these commoners lead. 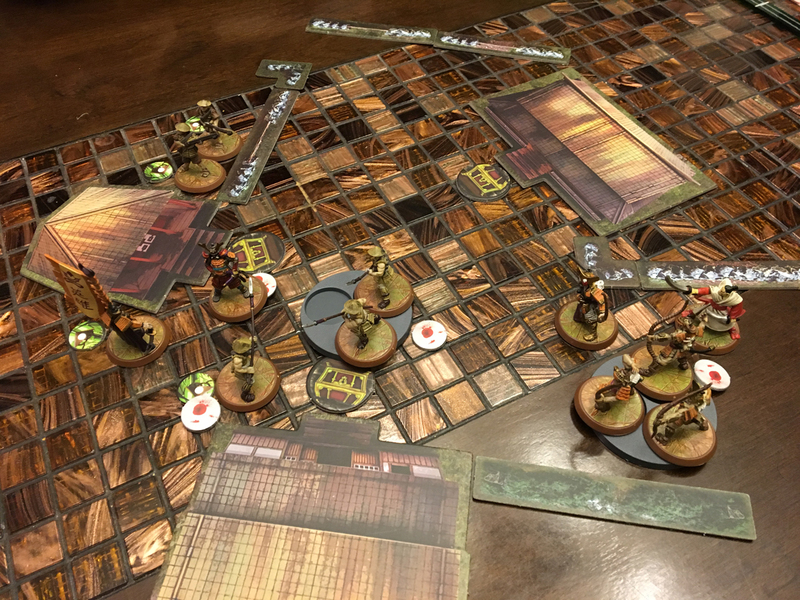 We go back and forth a couple more times but bad rolls and some fast rounds (due to quick Fate token pulls) end the game in a stalemate as I end up too far away to control the only uncontested objective (to control an objective, no enemy must be within 3″). Even though the game is pretty dicey and a string of bad Fate token pulls can be frustrating, we both enjoyed the game. 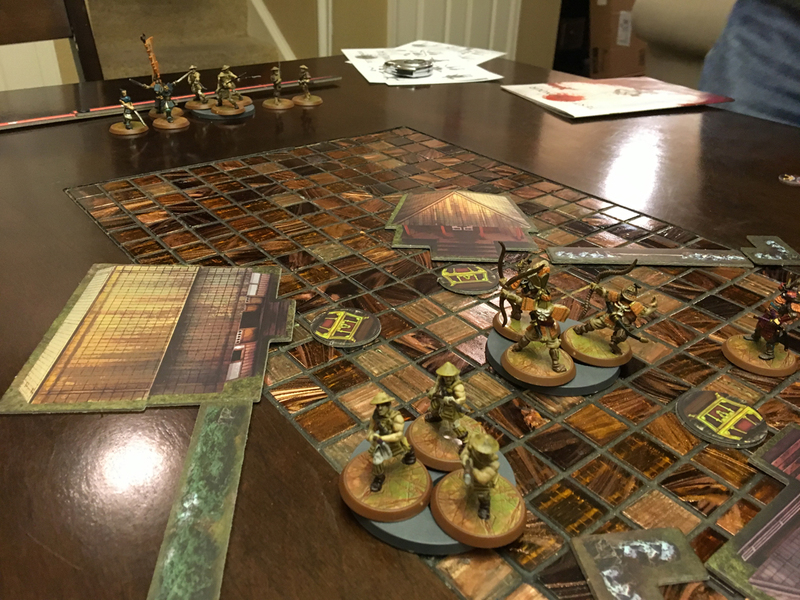 It’s a light skirmish game, lighter than Walking Dead: All Out War and I feel it’s a lot more chaotic since the activations aren’t set in an obvious and controllable way. The last game came down to my decision to have my Samurai try to kill that last spearman and remove him from contesting the last objective. 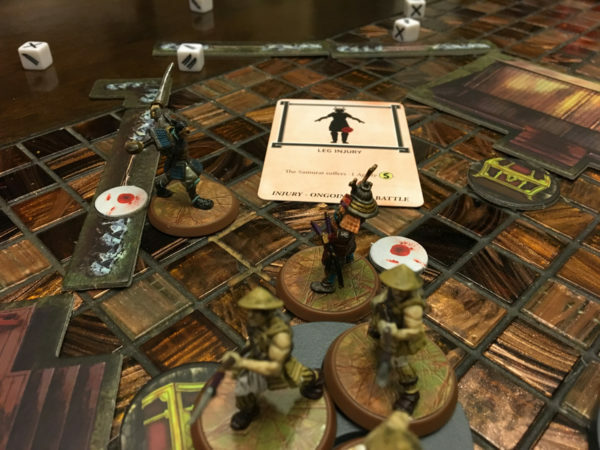 He failed (miserably too as he took a “dishonor” card to gain an extra die and still whiffed) and could have just went back to the other objective and camped out for victory. The next token pulled was the last Fate token and ended the last round. 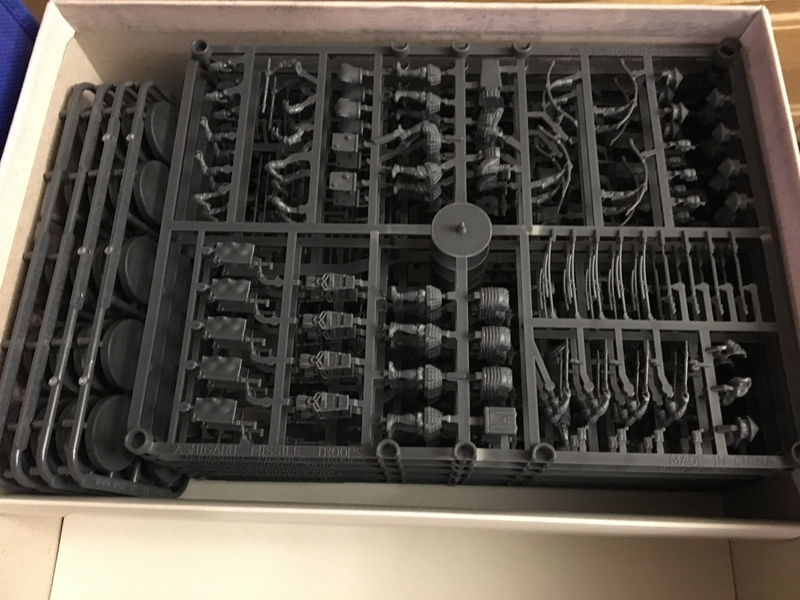 The biggest issue getting into this game is going to be the miniatures assembly. My friend doesn’t think it will be too bad but I’m impatient on this sort of thing. I’ll let him assemble his figures and then we can try it again. 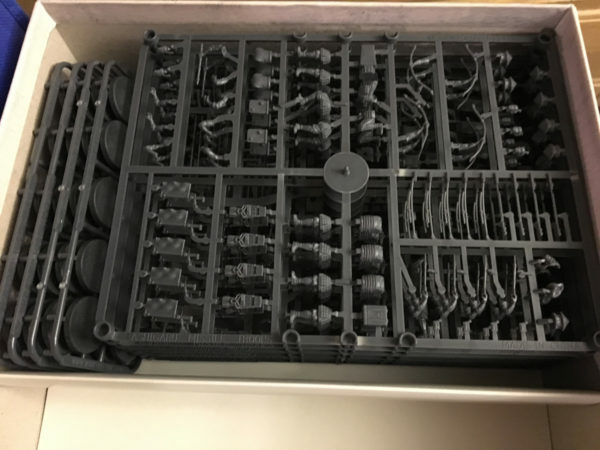 One thing worth noting is not all the expansions and figures are these multi-part sprued minis, a lot of the smaller sets are single-ish metal molds which make the assembling complaint totally disappear. There is definitely enough story and fun going on in the game that getting past that hobby issue won’t be too much trouble. I predict we’ll see more of this game in 2018. As an aside, I don’t consider myself a reviewer but this review of Test of Honour from the Ideas Without End blog is fantastic (probably one of the best written reviews I’ve read). Thanks for the compliment of my review – I enjoyed reading your thoughts on the game, too. I can say from experience the single-piece (or two-piece at most) metal miniatures are of a very high quality – I bought the Ninja box set recently and am amazed at how good they are. Thanks! 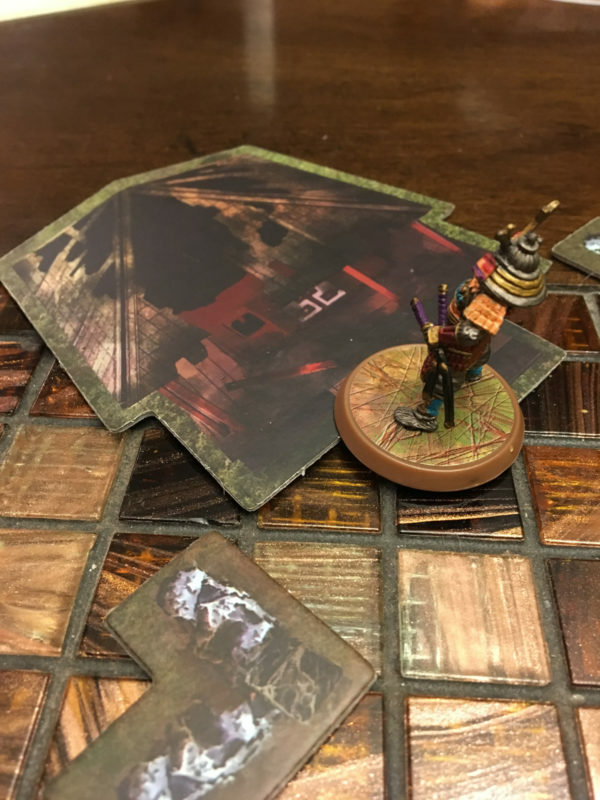 Your review helped push me to get the game to the table so nice work! The Ninjas were the other reason I started looking into the system. 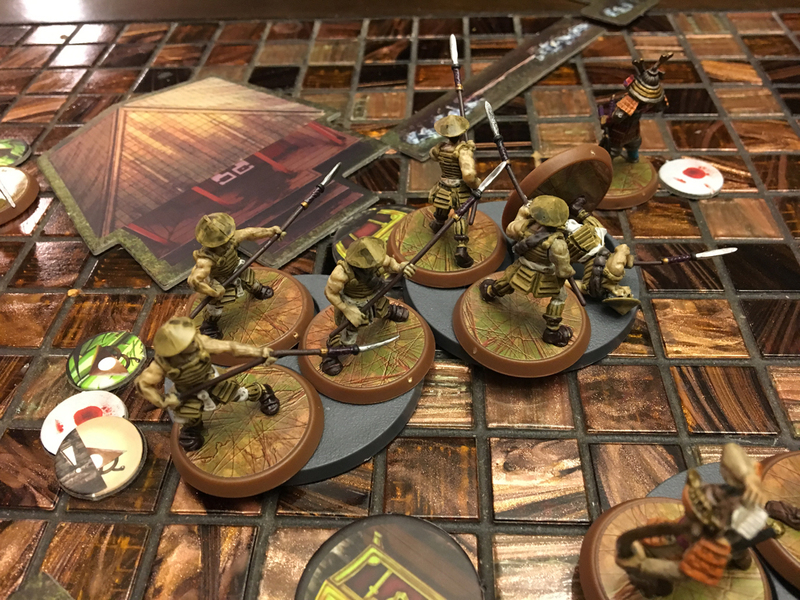 I really like the idea of the new “Dojo Assault” set pitting a bunch of ninjas against a well-disciplined Samurai. I’m glad to hear that the metal casts are a good quality.